Colin’s, founded in 1983, is a fashion brand with the mission of making people feel better with their products and services far beyond the garment industry. With a wide range of products for men and women, from casual wear, fashion and accessories, they serve a wide audience from their distribution center in Istanbul. Continued company growth and increasing product volumes were challenging current logistics capacity. In seeking the most effective way to increase capacity, improve accuracy and shorten lead times, Colin’s reached out to Equinox for an optimized solution. 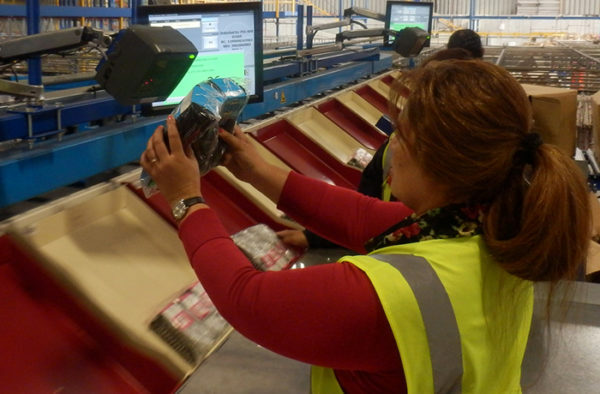 In an automated sorting system they found their solution. Extending the capacity of the current distribution center was a key objective of Colin’s. To create enough space for the new sorting system a mezzanine was installed. Thanks to the recently installed oval sorter with double split trays, Colin’s was able to achieve a sorting capacity of 17.600 items per hour! The project was a successful collaboration between Colin’s, Equinox and Lodamaster. By working closely together with Colin’s project team, Equinox was able to translate key requirements into a tailor made design. Lodamaster designed and delivered the surrounding conveyors and platforms, ensuring a perfect fit. Colin’s garments dimensions were a perfect match for the oval sorter with double trays. The oval sorter is named after the oval shaped conveyor on which the trays circulate. The large oval design allows operators to work in the open space inside of the oval, providing the maximum number of stations within a specific area. The double tray solution provided the possibility to dramatically increase sorting capacity. Both halves of the trays operate independently and collectively to offer greater flexibility and capacity. Smaller products are inducted on half trays while larger products utilize both trays. This provides optimized efficiency and increases throughput. Items for sortation are picked from the storage area on the ground floor and the cartons are placed on delivery conveyors for transport to the Equinox sorter. Each carton has a unique barcode ID that is linked to the contents residing in the Equinox software through an automatic data interface between Colin’s main computers and the Equinox computers. When the cartons arrive at the split tray sorter then they are automatically directed to one of the two ergonomically designed sorter induction zones, each equipped with eight infeed points. Items are taken out of the cartons and inducted onto the sorter. An integrated omnidirectional scanner automatically scans all inducted products, which relieves the operators from the task of having to scan all items manually. By automating this task, operator scanning errors are eliminated. When the operator has emptied a carton, it can be pushed onto the automatic empty carton take-away conveyor. This keeps the operator platforms clear while eliminating the need for additional staff to manually move product containers. The inducted products are automatically transported along the sorter on the double split trays and are discharged directly into required shipment carton. To achieve a capacity of 17.600 items per hour, the induction platforms are placed on both ends of the sorter. 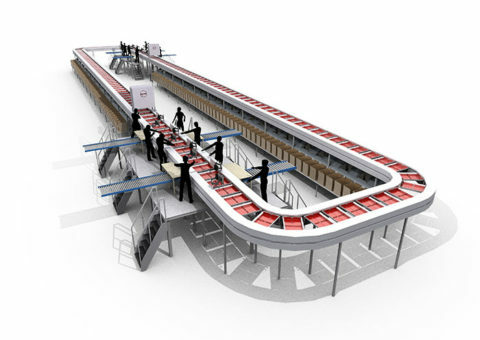 By using smart routing logic for the cartons to the induction platforms, most items that are inserted on the platform on one side of the sorter are sorted into one of the stations before passing the next platform. This way a tray can be used to sort out two items each round. Once a carton at one of the stations is full, operators push them onto automatic take away conveyors in the middle of the sorter.